It appears that the Syrian army, with its Iranian and Hezbollah allies, have launched a new offensive northwest of Aleppo. They are pushing northwestwards from Aleppo towards Nubi and al Zahran, and southeastwards from Nubi and al Zahran towards Aleppo. They seem to be trying to catch 'rebel' held Huraytan in a pincer movement. Your map is quite optimistic, the "disputed area" looks more like the aims for the near future. In http://www.sciforums.com/threads/mi...and-iraq-thread-3.155917/page-34#post-3448791 I have two other maps about this offensive. I would not expect fast success, the ... in Idlib are yet strong enough, and Aleppo is important, so there will be no collapse of their front lines. Without this, the ideal way to encircle them would be by taking several mountains. Anadan itself is plane, to surround it you have to take mountains. To take mountains is difficult, they can be easily defended. But it is possible, with advantage in aircraft. And, once taken, it is easy to defend, even if the pincer is not yet closed and above parts could be, on a plane, easily attacked by the flanks. And the operation of taking it does not have a high risk of civilian casualties. It shows the quite large number of peace agreements where the Syrian army takes control of the town, but the rebels have a choice, either to surrender and take amnesty, or to travel to Idlib with handguns and family in a bus. It seems that both(all ?) sides have the military power to take positions, but not the manpower to hold them. The rebels who supplies them with weapons and money ? The suppliers of money and weapons are criminals. Have they not done enough of damage and suffering to humanity? The Syrian army has simply a lot of manpower which is not high quality. They are local fighters, sufficient to defend their villages or towns against similar forces from the neighbor village or town. But against a heavy, concentrated attack force - and Idlib has yet enough of such forces to form them - they are simply not sufficient. On the other hand, one has to think about the possibility that this scenario was quite satisfactory for the Syrian army. If the initial attack would have failed, there would not have been much losses on the side of the attackers. So, they were, after the initial success, attacking much better prepared and much more comfortable positions behind the frontline. Most of their fighting power has been lost in many attacks against Qomhana, and behind Qomhana was a hill which was ideal for the Syrian army artillery. Then, a lot of the fighting power of joepistole's comrades depends on good prepared defenses. They have a lot of time to prepare them, and do it. Say, the main problem of attacking Qaboun is that they are encircled only formally, but have a lot of tunnels connecting them with Ghouta. But if they have taken some new villages, they had no time for constructing good defenses, thus, their defenses will be weak. An easy target for airforce and artillery, much easier than in well-prepared defenses. And the Syrian army has time - they have no problem to attack a village many days from distance, until almost nobody remains there - the population has left these villages anyway, so there is no big problem with civilian casualties. So, in this variant the losses of joepistole's comrades will be much greater, during the time of the attacks as well as during the time of defense. What is to expect in near future? I think it is not an accident that the Syrian army has, up to now, simply recovered the lost territory, and would not even wonder too much if they stop now. This is not what I expect - I think they will use the fact that joepistole's comrades are outpowered now to take more territory. Actually, there is information about heavy air/artillery attacks against Latamnah, and if they really take Latamnah, Halfya and Taibat al Imam would become undefensable anyway. Then, Morek is also a natural target, and that the Tiger forces have, after taking Souran, not attacke Taibat al Iman immediately, but, instead, retaken Tal Bisam North of Souran (joepistole's comrades had retaken it in some counterattack) hints that Morek is a target. There has been also information about the arrival of further reinforcements, which suggests they don't want to stop now. But I doubt they will take much - sufficient to clarify that such offensives finally lead not to gains but losses (the last big offensive there has resulted, finally, in some gains, mainly because the fight for Aleppo was much more important for Syria, so that they have left this). But there is no reason to do more. Idlib has yet its value as a place to transfer all the fighters from everywhere, and there is nothing important or so inside. It will be the last region to attack. 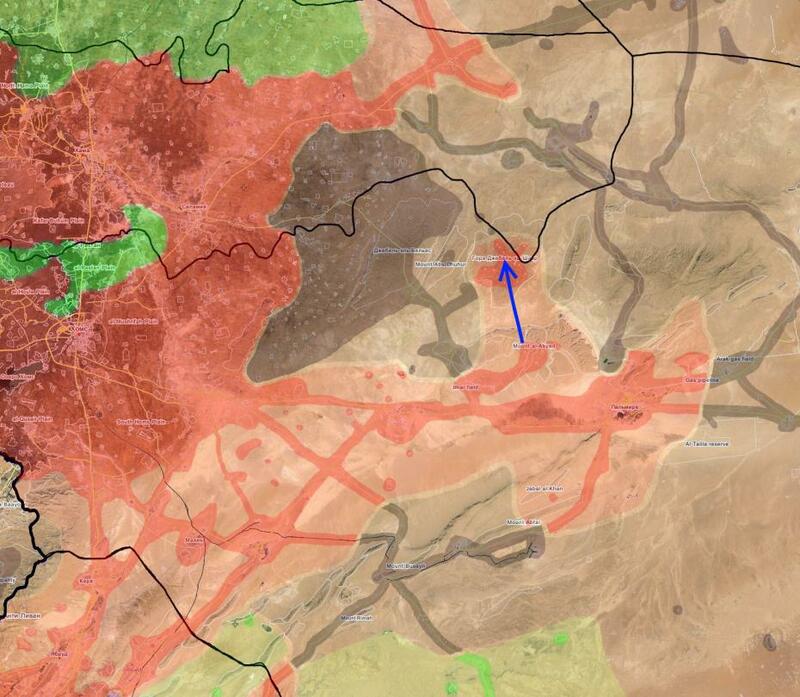 The exchange of Fua and Kafrya also make sense only once they do not plan to liberate these enclaves in near future. So, the question is where they decide to stop now. Morek - Kafr Zita would be a quite natural line, simply taking North Hama but leaving Idlib itself untouched. Taking Khan Sheikhun would be, instead, a signal that enough is enough, no further attacks on North Hama, and also, as a sufficiently important town in Idlib, a nice place for the Idlib government of Syria. Moreover, a chance to find evidence for the gas fake on the ground. There was a heavy suicide attack against civilians - those transferred from Fua and Kafrya to Aleppo - with 70 or so civilian casualties. https://www.almasdarnews.com/article/angry-syrian-army-speeds-preparations-west-aleppo-offensive/ One can expect that, as a response, there will be attacks in the region West of Aleppo, a region which is much more important, in particular for the security of Aleppo, than taking Khan Sheikhun. Taibet al Iman has been taken by the Syrian army. After this, the offensive of joepistole's comrades has not only given no advantage at all, but now even lead to losses. This map seems also no longer actual, the village Kfair Taibaa has been reported to be taken, and there is fighting near Zor Helsa (Abu Obeida, North-West of Helfaia, is of the wrong color too, it has been taken by the Syrian army long ago). Helfaya is clearly a candidate for being given up/taken during the next time. But Morek also seems a candidate. The last news is that a checkpoint Aboud ~1 km South of Morek has been taken. As I have expected, Helfaya has been taken by the Syrian army today in the morning. Hatesh has probably left it during the night. So, it seems there was no fighting, but the remaining local fighters from Helfaya have made a request for peace/surrender which has been accepted. Same for Zor Heisa and Zawr Abu Zaid. Good let them stop fighting . Syrian people had enough of destruction, and casualty. The only beneficiary are the commanders who are in comfortable place sipping wine and getting money from sponsors like Saudi, Iran and USA . After a cry for help made by Hatesh, various other islamist groups from Idlib are said to have send various reinforcements. In particular, many of those who have moved by green buses from other enclaves are said to have arrived. Whatever, yesterday they felt strong enough to start several counterattacks. But these counterattacks have not given any results. Two villages or so seem to have been taken for some time, or there was some fighting inside the villages. At the end, there have been no gains from this counteroffensive at all. During the last days, there has been also information about several gains of the Syrian army in Qabun, a suburb of Damask. Not very much every time - a mosque, some electricity station, some buildings, some street - but steady progress. Several times, some tunnels connecting Qabun with the greater East Ghouta enclave have been found and destroyed. Everybody has expected some Daesh offensive in Deir Ezzor, given that there was talk that the new Daesh capital has been moved into the Deir Ezzor province, which would motivate an intensification of attempts to take Deir Ezzor itself. Moreover, there was some sandstorm, with nothing visible on the ground, thus, not much use of the airforce - thus, ideal time to attack, which has been also used in the past for such attacks. And, indeed, there was such an attack. But it has not given any results for Daesh. In Mossul, the Iraqi army has taken another district. As Schmelzer details, the Syrian army seems to have had some success pushing "the rebels" back northwards, away from the edge of Hama. There doesn't seem to have been much movement in recent days near Raqqah. I'm guessing that the SDF (and perhaps American special forces accompanying them) are reinforcing their presence south of Tabqa dam, in preparation for pushing eastwards along the south bank of the Euphrates to a point just south of Raqqah. (With its bridges cut, the river represents a barrier to vehicular traffic.) That would pretty much complete the encirclement of Raqqah (located on the north side of the river). They don't seem to be attacking the dam or the town of Tabqa, which are encircled but still in ISIS hands. Turkey has been muddying the waters by launching airstrikes on the SDF, alleging that they have been supplying arms to PKK rebels in Turkey. In Mosul, ISIS is still stubbornly holding out in the old city, which is now surrounded on three sides. The Iraqis repeatedly send small units probing into the narrow streets and ISIS pushes them out again. But the Iraqis seem to have recaptured about half of the west side of Mosul, leaving them in control of about 3/4's of the city. I'm guessing that they may be planning to push northeastwards to surround the old city. They have already cut Mosul off from Tal Afar to the west, the other remaining ISIS bastion in northern Iraq. Road communication between ISIS held parts of Syria (Raqqah and most of the Euphrates river) and both Mosul and Tal Afar has been cut. Here's a good recent map of events in the Raqqah area from Wikipedia commons (click on it to increase the scale). Just from looking at it, it appears that the SDF fighters have been making repeated use of envelopment, trying to flank and/or encircle opposing forces instead of attacking them head-on. There seems to be another envelopment (a full encirclement) of ISIS front-line forces currently underway directly north of Raqqah (the green arrows). Encircling Raqqah from the south would just continue the pattern. An interesting point is that, despite the fact that a whole network of tunnels have been already destroyed, there are, yet, some tunnels. Which is the other interesting news from this area: A serious infighting among joepistole's comrades has started, with already more than 100 dead as the result. The fighting is about some depots, but also about the access to the remaining tunnels, and actually the situation is that all the remaining tunnels to Qabun are controlled by one of the factions. You claim that your chief concern is the fight against Islamic terrorism, so why do you not mention the ongoing successes of the US and its allies against ISIS? Why do you only report "news" intended to make drunk losers in Russia feel good about themselves and their crumbling Mafia state? A new front of the Syrian army fighting Daesh seems to have been opened, the big region West of the Shaer gas fields (the blue arrow on the map of #11) is attacked from South and West. I'm glad to see that the Syrian army is following up its victories in Palmyra with an offensive up in that area. Given ISIS' increasingly desperate situation all over the map, it might be ripe for the taking. I wish the Syrian army success there. Apparently the SDF has entered the town of Tabqa, next to the Tabqa dam. They seem to have successfully taken most of the town from its ISIS defenders but fighting continues. Turkey is making noises about launching more air strikes on the SDF and is expressing its profound displeasure at the US alliance with them. Erdogan is due to visit Washington next month. I have made claims about my chief concern? Really? Sorry, but I would never make claims about my chief concerns in a public forum. Care about your fantasies yourself. Apparently the SDF has entered the town of Tabqa, next to the Tabqa dam.